Nematron gain ATEX Zone 2 & 22 rating to meet increased Certification demands. A long term proponent of UL Certified Class I & II, Division 2 Hazardous Location rated products Nematron has announced ATEX compliance for its Industrial PCs & Monitors. By their nature many processes in the manufacture of chemicals & petrochemicals invariably produce hazardous environments; similarly grain processing and manufacturing processes such as Automotive Paint Shops have areas where a potentially explosive atmosphere can exist. The ATEX Zonal System defines the level of hazard and the technical level of compliance that equipment operating within the Zones is required to meet to ensure safe operation. 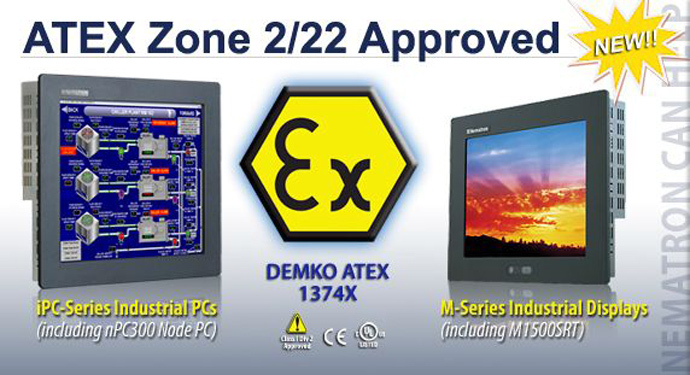 Correctly installed in an ATEX Zone 2 & 22 enclosure Nematron Panel PCs & Monitors can be placed directly in the hazardous environment thus avoiding the need for expensive custom built explosion proof enclosures. The DEMKO 14 ATEX 1374X certificate of compliance has been awarded on their iPC-Series and M-Series products making Nematron a member of a very limited group of suppliers to undergo the rigorous certification process for Open Frame Construction. This is an ideal development for European projects where ATEX is the certification standard of choice.